AUTHOR OF The Little Minister. A Window in Thrums. Auld Licht Idylls, etc. NEW YORK PUBLISHING COMPANY,NEW YORK. 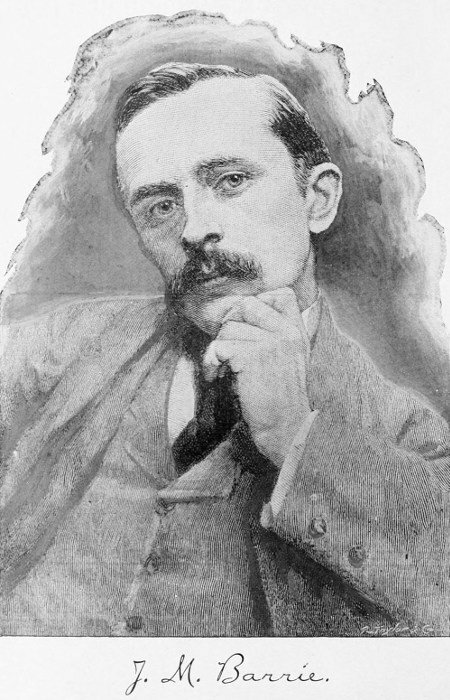 Copyrighted 1892, NEW YORK PUBLISHING CO.
PRESS AND BINDERY OF HISTORICAL PUBLISHING CO., PHILADELPHIA, PA.
James Matthew Barrie was born at Kirriemuir, Forfarshire, on May 9, 1860. Kirriemuir, as soberly stated by the Encyclopædia Britannica, is “a borough of barony and a market town of Forfarshire, Scotland, beautifully situated on an eminence above the glen through which the Gairie flows. It lies about five miles northwest of Forfar, and about sixty-two miles north of Edinburgh. The special industry of the town is linen weaving, for which large power-loom factories have recently been built.” Mr. Barrie has made his birthplace famous as Thrums, after hesitating for a little between that name and Whins, which is the word used in the earliest Auld Licht sketches. Only a part of Mr. Barrie’s boyhood was spent in Kirriemuir. At an early age he went to Dumfries, where his brother was inspector of schools. He was a pupil in the Dumfries Academy. At that time Thomas Carlyle was a not unfrequent visitor to the town, where his sister, Mrs. Aitken, and his friend, the venerable poet editor Thomas Aird, were then living. Carlyle is the only author by whom Mr. Barrie thinks he has been influenced. The Carlyle fever did not last very long, but was acute for a time. He fervently defended his master against the innumerable critics called into activity by Mr. Froude’s biography. Apart from this, Dumfries seems to have left no very definite mark on his mind. The only one of his teachers who impressed him was Dr. Cranstoun, the accomplished translator from the Latin poets, and he rather indirectly than directly. In the Dumfries papers Mr. Barrie inaugurated his literary career by contributing accounts of cricket matches and letters, signed “Paterfamilias,” urging the desirability of pupils having longer holidays. He was the idlest of schoolboys, and seldom opened his books except to draw pictures on them. In 1882 he graduated, and was for some months in Edinburgh doing nothing in particular. In the meantime he saw an advertisement asking for a leader writer to an English provincial paper. The salary offered was three guineas a week. He made application for this, and found himself, in February, 1883, installed as leader writer to the Nottingham Journal. He was not editor, the work of arranging the paper being in other hands; but he was allowed to write as much as he pleased, and practically what he pleased. During the last months of his stay in Nottingham, Mr. Barrie had begun to send articles to the London papers. The first of these was published by Mr. Stead, then editing the Pall Mall Gazette. In March, 1888, a much more important book, “Auld Licht Idyls,” was published. When Mr. Barrie came up to London he had letters of introduction from Professor Masson to an eminent publisher, and to Mr. John Morley. He took his “Auld Licht Idyls” to the publisher, and was told that, although they were pleasant reading, they would never be successful as a book. Mr. Morley, then editor of Macmillan, asked him to send a list of subjects on which he was willing to write. The request was complied with, but the subjects were returned by Mr. Morley with the singularly uncharacteristic comment that they were not sufficiently up to date. Mr. Morley, who has since read with great admiration all Mr. Barrie’s works, was much astonished at having this brought to his remembrance the other day. “When a Man’s Single” was published in September, 1888, dedicated to W. Robertson Nicoll. The story was originally published in The British Weekly, but, as his manner is, Mr. Barrie made great changes in revising it for publication. It was well received, and was pronounced by the Daily News as “Perhaps the best single volume novel of the year.” It is not at all autobiographical, though it gives the author’s impressions of journalistic life in Nottingham and London. Perhaps the best parts of it are those devoted to Thrums, of which George Meredith expressed special admiration. Mr. Barrie’s greatest book, however, was yet to come. “A Window in Thrums” was published in May, 1889. It contained articles contributed to the National Observer, The British Weekly, and the St. James’s Gazette, along with new matter. It is not too much to say that it was received with one burst of acclamation. It has been the most popular of the author’s works, and it is hard to conceive how he can surpass certain parts of it. It has found admirers among all classes. “My Lady Nicotine,” reprinted from the St. James’s Gazette, was published in April, 1890, and a second edition appeared in September, 1890, and although issued later than “A Window in Thrums,” it is really in point of time almost the first of the author’s books. 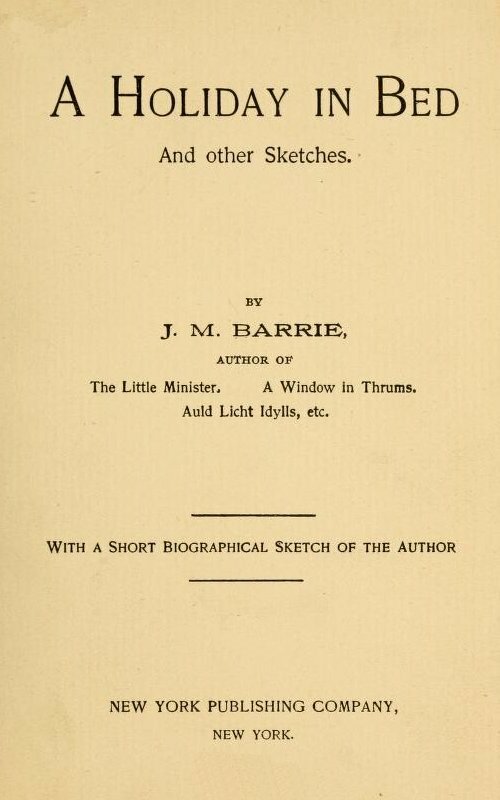 In January, 1891, Mr. Barrie commenced a story in Good Words, entitled “The Little Minister,” which has since been issued in book form, and is acknowledged to be his best book. People have tried a holiday in bed before now, and found it a failure, but that was because they were ignorant of the rules. They went to bed with the open intention of staying there, say, three days, and found to their surprise that each morning they wanted to get up. This was a novel experience to them, they flung about restlessly, and probably shortened their holiday. The proper thing is to take your holiday in bed with a vague intention of getting up in another quarter of an hour. The real pleasure of lying in bed after you are awake is largely due to the feeling that you ought to get up. To take another quarter of an hour then becomes a luxury. You are, in short, in the position of the man who dined on larks. Had he seen the hundreds that were ready for him, all set out on one monster dish, they would have turned his stomach; but getting them two at a time, he went on eating till all the larks were exhausted. His feeling of uncertainty as to whether these might not be his last two larks is your feeling that, perhaps, you will have to get up in a quarter of an hour. Deceive yourself in this way, and your holiday in bed will pass only too quickly. Sympathy is what all the world is craving for, and sympathy is what the ordinary holiday-maker never gets. How can we be expected to sympathize with you when we know you are off to Perthshire to fish? No; we say we wish we were you, and forget that your holiday is sure to be a hollow mockery; that your child will jam her finger in the railway carriage, and scream to the end of the journey; that you will lose your luggage; that the guard will notice your dog beneath the seat, and insist on its being paid for; that you will be caught in a Scotch mist on the top of a mountain, and be put on gruel for a fortnight; that your wife will fret herself into a fever about the way the servant, who has been left at home, is carrying on with her cousins, the milkman and the policeman; and that you will be had up for trespassing. Yet, when you tell us you are off to-morrow, we have never the sympathy to say, “Poor fellow, I hope you’ll pull through somehow.” If it is an exhibition you go to gape at, we never picture you dragging your weary legs from one department to another, and wondering why your back is so sore. Should it be the seaside, we talk heartlessly to you about the “briny,” though we must know, if we would stop to think, that if there is one holiday more miserable than all the others, it is that spent at the seaside, when you wander the weary beach and fling pebbles at the sea, and wonder how long it will be till dinner time. Were we to come down to see you, we would probably find you, not on the beach, but moving slowly through the village, looking in at the one milliner’s window, or laboriously reading what the one grocer’s labels say on the subject of pale ale, compressed beef, or vinegar. There was never an object that called aloud for sympathy more than you do, but you get not a jot of it. You should take the first train home and go to bed for three days. To enjoy your holiday in bed to the full, you should let it be vaguely understood that there is something amiss with you. Don’t go into details, for they are not necessary; and, besides, you want to be dreamy more or less, and the dreamy state is not consistent with a definite ailment. The moment one takes to bed he gets sympathy. He may be suffering from a tearing headache or a tooth that makes him cry out; but if he goes about his business, or even flops in a chair, true sympathy is denied him. Let him take to bed with one of those illnesses of which he can say with accuracy that he is not quite certain what is the matter with him, and his wife, for instance, will want to bathe his brow. She must not be made too anxious. That would not only be cruel to her, but it would wake you from the dreamy state. She must simply see that you are “not yourself.” Women have an idea that unless men are “not themselves” they will not take to bed, and as a consequence your wife is tenderly thoughtful of you. Every little while she will ask you if you are feeling any better now, and you can reply, with the old regard for truth, that you are “much about it.” You may even (for your own pleasure) talk of getting up now, when she will earnestly urge you to stay in bed until you feel easier. You consent; indeed, you are ready to do anything to please her. The ideal holiday in bed does not require the presence of a ministering angel in the room all day. You frequently prefer to be alone, and point out to your wife that you cannot have her trifling with her health for your sake, and so she must go out for a walk. She is reluctant, but finally goes, protesting that you are the most unselfish of men, and only too good for her. This leaves a pleasant aroma behind it, for even when lying in bed, we like to feel that we are uncommonly fine fellows. After she has gone you get up cautiously, and, walking stealthily to the wardrobe, produce from the pocket of your great coat a good novel. A holiday in bed must be arranged for beforehand. With a gleam in your eye you slip back to bed, double your pillow to make it higher, and begin to read. You have only got to the fourth page, when you make a horrible discovery—namely, that the book is not cut. An experienced holiday-maker would have had it cut the night before, but this is your first real holiday, or perhaps you have been thoughtless. In any case you have now matter to think of. You are torn in two different ways. There is your coat on the floor with a knife in it, but you cannot reach the coat without getting up again. Ought you to get the knife or to give up reading? Perhaps it takes a quarter of an hour to decide this question, and you decide it by discovering a third course. Being a sort of an invalid, you have certain privileges which would be denied you if you were merely sitting in a chair in the agonies of neuralgia. One of the glorious privileges of a holiday in bed is that you are entitled to cut books with your fingers. So you cut the novel in this way, and read on. Those who have never tried it may fancy that there is a lack of incident in a holiday in bed. There could not be a more monstrous mistake. You are in the middle of a chapter, when suddenly you hear a step upon the stair. Your loving ears tell you that your wife has returned, and is hastening to you. Now, what happens? The book disappears beneath the pillow, and when she enters the room softly you are lying there with your eyes shut. This is not merely incident; it is drama. During a holiday in bed one never thinks, of course, of analyzing his actions. If you had done so in this instance, you would have seen that you pretended sleep because you had got to an exciting passage. You love your wife, but, wife or no wife, you must see how the passage ends. In that case the reason of your change of action is obvious. But why do you not let your wife know that you have been reading? This is another matter that you never reason about. Perhaps, it is because of your craving for sympathy, and you fear that if you were seen enjoying a novel the sympathy would go. Or, perhaps, it is that a holiday in bed is never perfect without a secret. Monotony must be guarded against, and so long as you keep the book to yourself your holiday in bed is a healthy excitement. A stolen book (as we may call it) is like stolen fruit, sweeter than what you can devour openly. The boy enjoys his stolen apple, because at any moment he may have to slip it down the leg of his trousers, and pretend that he has merely climbed the tree to enjoy the scenery. You enjoy your book doubly because you feel that it is a forbidden pleasure. Or, do you conceal the book from your wife lest she should think that you are over-exerting yourself? She must not be made anxious on your account. Ah, that is it. You say you can take nothing, but if she likes she can cook a large sole, only you won’t be able to touch it. You glance at her face to see if she is in earnest, for you can remember three breakfasts, four luncheons, two dinners, and sandwiches between; but evidently she is not jesting. Then you yield. There is only one thing to guard against. Never call it a holiday. Continue not to feel sure what is wrong with you, and to talk vaguely of getting up presently. Your wife will suggest calling in the doctor, but pooh-pooh him. Be firm on that point. The chances are that he won’t understand your case.